The New York Art Residency & Studios (NARS) Foundation is pleased to present a group exhibition featuring work from the 2017 Season II International Artist Residency participants: Ololade Adeniyi, Bat Ami Rivlin, Jesus Benavente, Jahyun Seo, Nooshin Rostami, Sean Campbell, Buzz Slutzky, Bonnie Lane, Ju Ae Park, and Baris Gokturk. 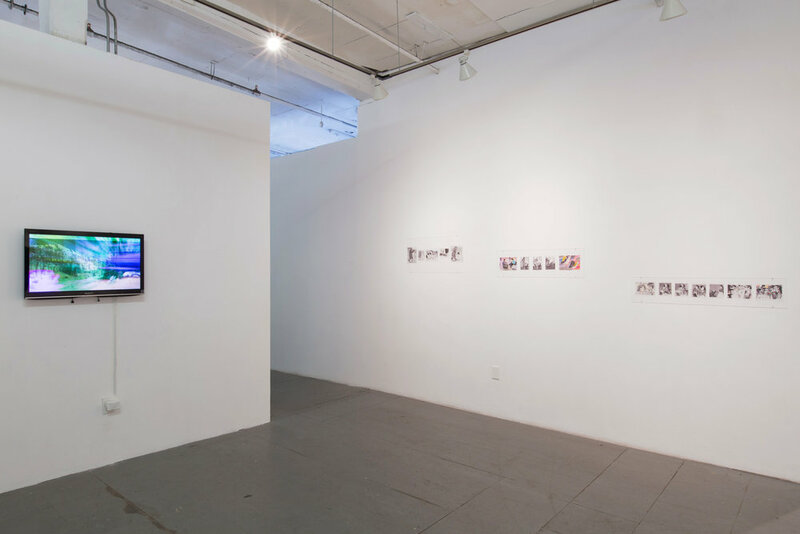 The exhibition showcases the diverse research interests, materials, processes, and presentation modes that underlie the art practices the artists in residence have continued to explore and develop alongside each other, over the course of three to six months in South Brooklyn. Ololade Adeniyi’s Eden 2.0 (Ongoing) is a reoccurring series of surveillance videos that depict a surreal utopia saturated with fragments of a world infiltrated and influenced by operations of desire. The videos hint at a fourth dimension of conversation, with the taste of hypnotic looping, undulating and cascading walls on the tip of ones tongue, they directly confront the blurred relationship between reality and fantasy; therefore ultimately suggesting that a personal perception of the future amongst minority groups could be a result of the fusion with the very machines originally used to create repression. In Bat-Ami Rivlin’s sculptures found objects, such as corporate plaza ashtrays or more household materials are re-purposed and rendered unrecognizable as they are combined to form new objects that not only have a body and sense of their own but seem to also suggest the human body and its functions. Somewhere between photography and painting, Jesus Benavente’s prints on latex embody the process and materiality of the images. Text scribbled on balloons, once deflated and scanned, retains its textual quality, even legibility, but also becomes the site of an event. 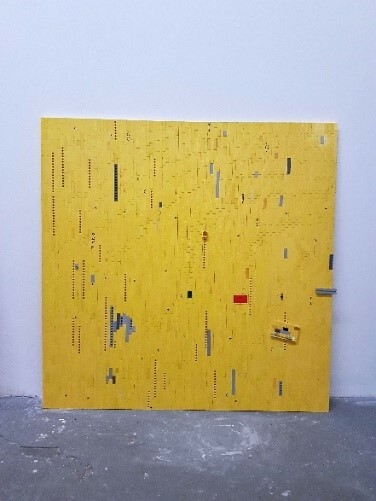 Jahyun Seo's work explores the process and transference between analog and digital media. Her work, influenced by her training and background in textiles, is the result of a meticulous layering of tape and paint to create a composition and form that is often, later, digitally manipulated to generate new images. Nooshin Rostami’s abstract drawings take simple geometric forms as their starting point and through repetition, size, and transparency achieve movement, rhythm and space that bears resemblance to different landscapes: a wavy ocean, rolling hills, mountains, nomadic tents, and so forth. Sean Campbell’s installation 4-Year-Olds Don’t Act Like Trump (Wall: Prototype VII + VIII) uses Legos as medium to spark a sense of interactivity with the built environment and to reference a confluence of political, social, and technological factors in the construction of identity and sense of place. For this installation he used a site specific research process to identify markers of local geographical identity, such as a 3-d printed tree stump scanned precisely from one found in Sunset Park. Buzz Slutzky’s drawings juxtapose images from two disparate and distant sources: a 70's self-defense manual -- Looking Forward to Being Attacked: Self-protection for Every Woman, written by an ex-police officer of the Memphis Police Department -- and TV commercials from the same era. The manual’s textual and visual language is not unlike that of advertising, which often delivers products with a dose of self-empowerment. Extracted from their original context and intersected with advertising images to comedic effect, the power dynamics are nevertheless present, if not thrown into sharp relief. Bonnie Lane’s self-titled text piece is a compilation of quotes from a variety of sources, including academic, professional, medical, familial, and romantic. These quotes are stitched into a textual collage which constitutes a satirical biography exposing the pervasiveness of criticisms and misrepresentation in all facets of the artist’s life. The piece questions its own authenticity and stimulates questions of representation, shame, morality, power dynamics, fiction, and autobiography. 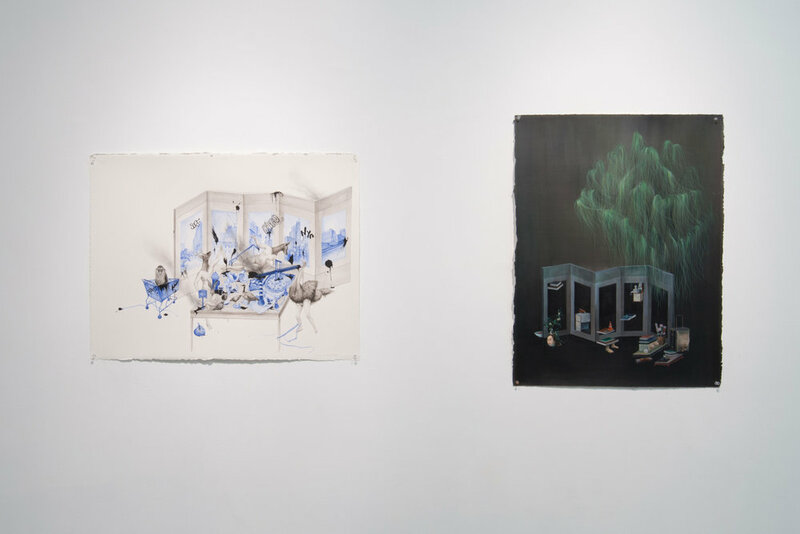 Ju Ae Park, in a departure from the landscape of Jeju Island that has defined her painting practice, explores her new surroundings and experience in New York through personal, if anecdotal, episodes, objects, and characters that are at once lived, imaginary and surreal. This new series of works, while thematically about her first trip to the West, draws heavily from Chinese and Korean painting traditions, spatial quality, and imagery. 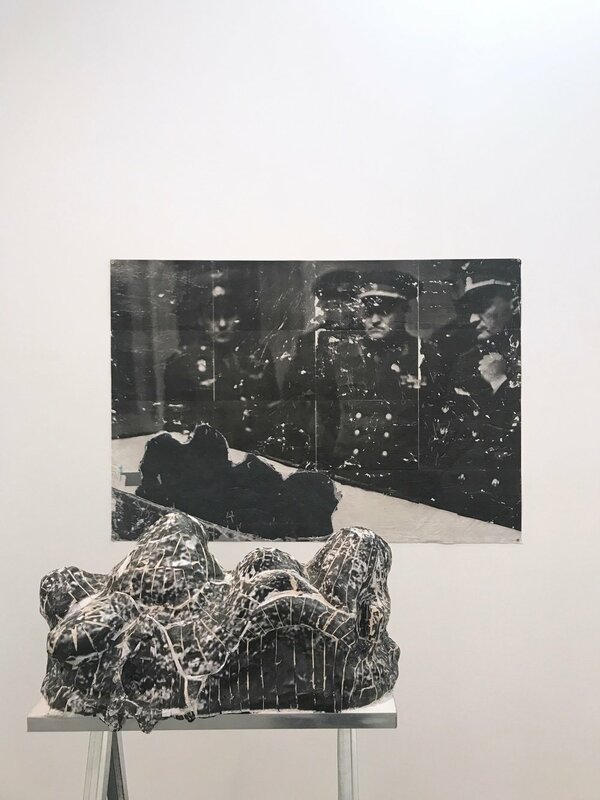 Baris Gokturk’s ‘Untitled (The Kozmonaut),’ an installation with a free standing sculpture and a 2d wall-hanging element, inserts the viewer into a tenuous relationality with both the militaristic figures in the photo and the amorphous mass on the table. The piece implicates the viewer in a cryptic involvement in some undetermined event, creating a sense of in-betweenness in time, place, and context. While the parenthetical title gives hint to the contents of the unnamed mass, the historical and political implications remain unexplained and ask for further investigation.